The latest developments in prenatal technology conceived by scientists at the Wayne State University School of Medicine that make it possible to test for genetic disorders a little more than one month into pregnancy were revealed this week in Science Translational Medicine, a journal of the American Association for the Advancement of Science. In the article, the WSU researchers write that their non-invasive testing method -- Trophoblast Retrieval and Isolation from the Cervix -- offers the accuracy of more invasive tests like the needle-directed amniocentesis, and can also be utilized five to 10 weeks earlier than current testing modalities. Trophoblast Retrieval and Isolation from the Cervix, or TRIC, was first publicized in 2014 in studies led by principal investigator and Professor of Obstetrics and Gynecology D. Randall Armant, Ph.D. The method isolates several hundred fetal cells that migrate from the placenta into the uterus using a retrieval technique akin to the common Pap smear, and can be done as early as five weeks into pregnancy. A related paper published by the two Sept. 23 in the Nature journal Scientific Reports called "Altered Biomarkers in Trophoblast Cells Obtained Noninvasively Prior to Clinical Manifestation of Perinatal Disease" describes the correlation between the levels of certain proteins in the fetal cells isolated by TRIC during the first trimester and the development of intrauterine growth restriction, which results in a small undernourished fetus in the womb, or preeclampsia - hypertension and kidney disorder of the mother - in the last trimester. "This finding suggests that it might one day be possible to test these protein levels to identify pregnancies at risk for pregnancy complications. Such a test could help physicians to better manage the health of mother and baby, and would streamline research on new interventions to prevent or limit the effects of disease," Dr. Armant said. The Science Translational Medicine paper demonstrates the researchers' ability to isolate fetal DNA from the cells obtained by TRIC. Since the placenta is derived from the embryo and its DNA is the same as that of the fetus, the researchers can use cells obtained by TRIC for prenatal genetic testing. 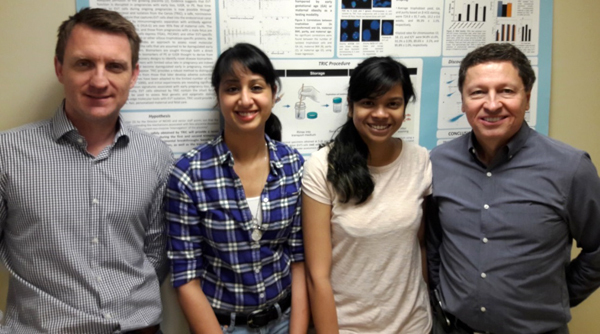 The paper was co-first authored by Chandni Jain, Ph.D. and Leena Kadam working in the laboratories of Drs. Armant and Drewlo. "We sequenced the fetal DNA and compared it to that of the mothers, proving that they were different, but the fetal DNA always contained one copy of the mother's DNA genes. We also had some DNA from the placenta and found that it was identical to the fetal DNA," Dr. Armant said. "We used next-generation sequencing and accurately determined the nucleotide sequence down to a single base. TRIC could be used as a noninvasive test, with the accuracy of invasive tests like amniocentesis, and the ability to perform the test five to 10 weeks earlier than current testing modalities," Dr. Drewlo added. The research was initially supported by a two-year exploratory grant given to Dr. Armant and colleagues in 2012 by the Eunice Kennedy Shriver National Institute of Child Health and Human Development of the National Institutes of Health to test capturing human fetal cells for genetic study. A paper on their investigative work from that time was published in the journal Fertility and Sterility in 2014. "Because the cells we purify by TRIC are placental cells that have a critical function early in pregnancy, their protein profile has been examined to determine if it becomes different in pregnancies that have serious complications like a miscarriage, undersized fetus or preeclampsia," Dr. Armant explained. "All of these projects require the contributions of many people, including Brian Kilburn, my lab manager, who finessed most of the ideas for TRIC to make the procedure work; graduate students and postdocs working with us; and the physicians who were willing to obtain the specimens," Dr. Armant said. "Since TRIC provides the cells of interest, we can probe their RNA and protein profiles using next-generation proteomics and transcriptomics approaches. For fetal genetic studies, we next plan to determine if TRIC can identify genetic disorders in the fetus. This would give parents information about the likelihood of their fetus having a genetic disorder much earlier in pregnancy than current tests. Very soon, we would like to begin clinical trials with all of these potential tests," Dr. Armant said. "Finally, the cells we obtain by TRIC have been little-studied, and we would like to learn more about their origins and relationship to their counterparts that remain in the placenta. It is very gratifying to see, and very exciting to be part of a growing team that is making new discoveries and developing ideas that hopefully will eventually improve health care for people starting new families." For more information on TRIC testing and the Center of Advanced Trophoblast Research, visit www.drewlolab.com. To learn about supporting their ongoing research efforts, call the School of Medicine's Office of Development and Alumni Affairs at 313-577-5929.